A bad witch's blog: Question: Should I Dismantle my Dreamcatcher? Question: Should I Dismantle my Dreamcatcher? Today, August 9, is International Day of the World's Indigenous Peoples, so I thought I would tackle an issue of possible cultural misappropriation that has been bothering me. Cultural appropriation is the adoption or use of elements of one culture by members of another culture. The problem is that when white non-native people adopt the elements of indigenous people's culture without permission, that is misappropriation. 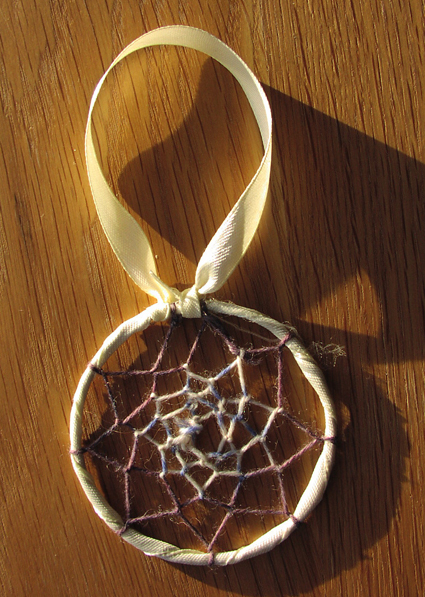 The making and owning of dreamcatchers can be considered misappropriation. In some Native American tribes, dreamcatchers (or dream catchers) are woven willow hoops traditionally made to help babies sleep peacefully by catching any bad dreams. However, they have become enormously popular as general home decorations and fashion items, losing their cultural connection. What is worse is that they are often made and sold by people who are not Native Americans. I made one myself. Now I wonder if I should feel ashamed and take it to pieces. I admit I had always been fascinated by dreamcatchers. I think they are beautiful and I had long wanted to learn how to make one. Last year I got a chance to do so - at a moot in London, in England. Although the person teaching the skill was very conscientious about explaining the background and history of dreamcatchers - and did not charge anything for the class - she was not Native American and so, perhaps, was not an appropriate person to give the lesson. The dreamcatcher, which you can see in the photo above, was made by upcycling pre-used materials including a metal bracelet, wool and some ribbon. Obviously these were not traditional materials either. Although I am pleased to have learnt about the history of dreamcatchers and how to make one, I am now considering whether to take mine apart so as not to cause offence to Native Americans. What do you think I should do? Note: According to Wikipedia: "Dreamcatchers originated with the Ojibwe people and were later adopted by some neighboring nations through intermarriage and trade. It wasn't until the Pan-Indian Movement of the 1960s and 1970s that they were adopted by Native Americans of a number of different nations. Some consider the dreamcatcher a symbol of unity among the various Indian Nations, and a general symbol of identification with Native American or First Nations cultures. However, many other Native Americans have come to see dreamcatchers as over-commercialized, offensively misappropriated and misused by non-Natives." I firmly believe in intention being behind actions. You wanted to make something artistically pleasing, without intending to give insult or injury. You made it for yourself, not to earn money for it. If you feel you want to dismantle it, you feel guilty by association with commercial mass producers who do want to make money without caring about insult or sensitivity. This guilt is, really, pointless. You understand the background and history of Deamcatchers and you are aware (now) of the potential offense caused to native Americans. I'm sure that if some native Americans were to pop in to your home and say they didn't like it then you'd happily dismantle it but, then again, I think they're more offended by the mass producers selling to tourists and New Agers and not a caring, well-intentioned individual. Maybe some Native Americans will now pop onto my blog and give their opinions. That would be great. And I would happily do whatever they asked so as not to cause offence. I agree with Bish, back in the 1970's a lot of Native American vision seekers , like John Lame Deer were very happy to teach non natives there ways, but in recent times the big business people have stolen so much of the culture that the trust has been lost.You made it as a sign of respect and interest in another culture , I too have made them , mainly because I have lost my own tribal culture (traveling people) and theirs is a culture I can feel close too. It sounds as if it would sit better with you if you did dismantle it. So do. No individual Native Americans who might pop onto your blog are in a position to speak for their entire race, anyway. Do what sits best in your own heart. i make dreamcatchers i use willow and yarn and keep it as natural as i possibly can. i like the twists and turns of the willow and i like the colours and textures of wool. i like the meaning behind them. i think that if they are made in a factory they become soulless. i think if somebody makes them all by hand and sells them there is something of the persons intentions behind them. i think good healthy things should be shared to the world. they were originally made by hand and used in a good way. if things stay only in their culture then the meaning doesn't get shared and the culture of these things make the world a large global culture which personally i prefer to divisions of us and them that is so hateful and rife. it is only big business and hard commercialism that i have an issue with about cultural appropriation. How do you feel about a native American, making a besom or doing candle majick? If you don't like it then don't copy their ways, but if you find that imitation is form of flattery, or you see it as part of interfaith work, then there shouldn't be a problem. The commercial dream catchers are money spinners though, as any witch worth their salt will know, its putting personal energy into things that makes them work. These are the things we should boycott. Genuine handmade by indigenous people at least puts income into their pockets rather than faceless companies. Apparently many Native American tribes have appointed recognised cultural representatives who are authorised to state an official view on whether something is cultural misappropriation or not in relation to their respective tribe. They mostly communicate with businesses though, rather than individuals doing little things privately for personal use only. Suzie, I have no problems at all with anyone making a besom - besoms are just old-fashioned brooms, anyone can make or use them. And seeing as I have a book published about candle magic, I'd be completely happy for anyone to give it a go! I wouldn't even see either of those things as flattery - brooms and candles don't belong to any particular culture.